Place the rice into a pan and give 3 sprays of frylight. Set at medium heat and stir rice until it begins to brown. Add 100ml of water, stock cube and chilli flakes. Reduce heat to low-medium and stir occasionally until rice absorbs the water, be careful not to let it stick to the pan. Once rice has absorbed water add the chopped peppers, garam masala, soy sauce and remaining 100ml of water. Set on a low heat and stir occasionally until all water has been absorbed. Serve. 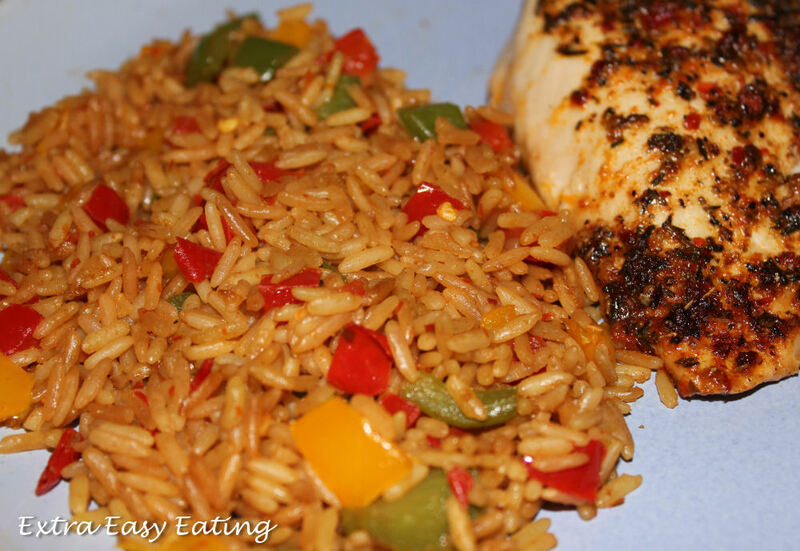 Today my husband returned with some marinated chicken breasts for dinner which were nice and slimming world friendly. I decided I wanted to have rice with the chicken, however I though it would need jazzed up a bit otherwise it would be quite dry. So I whipped up this little dish and it was rather tasty. Just as a word of warning you may want to add the chilli flakes slowly until you reach the desired heat as I about blew my heat off by adding to much! NB. The marinated chicken in the 'The Cook Menu' cajun marinade chicken from Marks and Spencers.